In our previous published article we took a look at Foot Strike Pattern and Associated Injuries. Today we look at a more positive aspect of each of the three previously identified strike patterns in addition to the running theories or ideals which embody these strike patterns. Once again as previously discussed in the associated injuries article there are a number of factors which can influence overall athletic performance including; core/proximal body strength, terrain, specificity of training, over/under training and footwear type just to name a few. A focus has been taken on foot strike patterns as not too over-complicate the discussion at hand. One of the bigger questions we should address before entering into the nitty-gritty of this debate is what performance means to you, the reader? Is it the ability to run fast? Is it the ability to cover extended distance? Is it the ability to recovery quickly? Is it the ability to complete multiple events and have long career? Is it technical strategy in approaching obstacles or corners? Speed: the pace at which the athlete has the potential to move based on anatomical movements of the discussed strike pattern. Efficiency: the ability to move from one point to another in a manner which places the least amount of stress on the body both anatomically and physiologically. Risk Reduction: the prevention or reoccurrence of injury to structures at most risk given the athlete’s history. 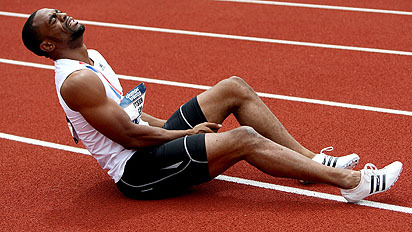 The faster an athlete moves, the closer ground contact becomes to the distal end of the foot (Michaud, 2011). This Foot strike series has been primarily concerned with sub-maximal running activity; when looking for increasing the speeds of runners the obvious place to look is upon the sprinters and those who cover much shorter distances at much faster pace. A sprinter should aim to have the foot moving backwards and behind the centre of mass at ground contact to lower forward velocity. Contacting the ground with the foot moving forward happens to create a breaking moment which slows the runner whether choosing to strike with the rearfoot, mid-foot or forefoot. An increase in breaking moments leads to an increase in contact time and therefore a decrease in speed however, foot strike is not the only component which may lead to said breaking moment; torso rotation, poor hip extension at the proximal muscle groups and excessive knee lift have all been shown to affect the breaking moment (Faccioni, 2014). Research has shown that elastic energy stored within the soft tissues of the body account for up to fifty percent of the total energy requirement of athletes. Actin and Myosin cross-bridges of muscle fibres as well as tendons account for the soft tissue structures which generate this energy. Proprioceptors pre-set muscle tension and communicate sensory input associated with rapid muscle stretching for the implementation of the stretch reflex. The greater the tension formed in the soft tissues being stretched, the more elastic energy is stored. Alexander (1987) showed that 93% of stored energy is able to be recovered from a tendon. Shorter stride lengths have been associated with better efficiency during running. It is believed that an individual is naturally able to pick a stride length which provides them the least metabolic cost to the body and that attempts to change this gait will increase the metabolic expenses of locomotion (Michaud, 2011). Additionally, it has been found that runners, who plantarflex at the ankle joint through a smaller range of motion during the propulsion phase, generate a faster velocity and higher return of energy due to the utilisation of isometric contractions. Running efficiency can be associated with low vertical variation of the bodies Centre of Mass which can be contributed to by a number of factors. In a study by (OGUETA-ALDAY, RODRI´GUEZ-MARROYO, & PEZ, 2014), it was shown that there are no statistically significant differences when comparing rearfoot and mid-foot striker efficiency from a metabolic and physiological standing, in a group of sub-elite half marathon runners. However, rearfoot strikers were shown to have a longer ground contact time and shorter flight time than mid-foot strikers (p<0.01), with no difference shown in stride rate or stride length between the two groups. According to (HASEGAWA, YAMAUCHI, & KRAEMER, 2007), rearfoot strikers and mid-foot strikers are more prevalent within the sub-maximal running categories than forefoot strikers. As discussed earlier shorter races attract a foot strike pattern much closer to a forefoot strike due to the desire for speed over endurance. When comparing foot strike pattern with oxygen uptake and percentage of carbohydrate storage there were no statistically significant difference between rearfoot and forefoot strike patterns. The biggest differences were seen when natural rearfoot strikers tried to perform forefoot strikes (p=0.007) and when forefoot strikers attempted to perform rearfoot strike patterns (p<0.001) (Gruber, Umberger, Braun, & Hamill, 2013). One of the highest risk factors for injury is the history of previous injury within the same structure. As the evidence bank increases in size, less and less attribution of injury has been associated with foot strike specifically and having more to do with motion control and over-training. Given that this is a well known and established factor within the sporting community is it worth changing an athlete’s running gait based on reoccurring injuries? If you read my previous article you would know that I do not believe so, that many other factors can be altered or reviewed before the gait of an older athlete is modified. However, without modifying an athlete’s competitive gait it is a viable option to use gait change as a cross-training measure to rest structures which are seen as overused and train those structures which are favoured less. In conclusion, foot strike pattern during running can have an effect on athletic performance. However, it appears that most athletes will position themselves in a way which generates the best strike type for the task they are trying to achieve. There is a natural instinct to forefoot strike in times which require speed, power and directional change, similarly, foot strike is modified when a task requires endurance and extended repetitive movement to the mid or rearfoot. There is always an avenue for the development of running technique associated with a particular foot strike pattern whether it be the backwards velocity and placement of the foot during forefoot ground contact or a sweeping moment at heel strike, there are many things which can be actively tweaked to get the best out of an athlete. Changing the chosen foot strike pattern on an athlete should not be the first train of thought, instead working with the strike pattern through strength and conditioning training should be adopted. Increasing metabolic by-products through the change of foot strike has the potential to not allow for effective recovery and may lead to an over-training effect. Alexander, M. (1989). The Relationship Between Muscle Strength And Sprint Kinematics In Elite Sprinters. Canadian Journal Of Sport Sciences , 148 – 157. Arendse, R. E. (2004). Reduced Eccentric Loading Of The Knee With The Pose Running Method. Medicine And Science In Sports And Exercises , 272-277. Bakkie, D., Mache, M., Johnson, C., Garcia-Krauss, P., Kendall, K., & Hsieh, T. (2013). Foot Strike Pattern Trends In Sub-Elite Half Marathon Runners. California: California State University. Brukner, P., & Khan, K. (2007). Clinical Sports Medicine. Mcgraw- Hill Education Pty Ltd.
Dugan, S. A., & Krishna P. Bhat. (2005). Biomechanics And Analysis Of Running Gait. Physical Medicine And Rehabilitation Of North America , 603–621. Faccioni, A. (2014). Speed Development For Team Sport Athletes. Helenvale: Asca. Giandolini, M., Horvais, N., Farges, Y., Samozino, P., & Morin, J.-B. (2012). Impact Reduction Through Long-Term Intervention In Recreational Runners: Midfoot Strike Pattern Versus Low-Drop/Low-Heel Height Footwear. European Journal Of Applied Physiology . Gruber, A., Umberger, B., Braun, B., & Hamill, J. (2013). Economy And Rate Of Carbohydrate Oxidation During Running With Rearfoot And Forefoot Strike Patterns. Journal Of Applied Physiology , 194–201. Hasegawa, H., Yamauchi, T., & Kraemer, W. J. (2007). Foot Strike Patterns Of Runners At The 15-Km Point During An Elite-Level Half Marathon. Journal Of Strength And Conditioning Research , 888–893. Kulmala, J.-P., Avela, J., Pasanen, K., & Parkkari, J. (2013). Forefoot Strikers Exhibit Lower Running-Induced Knee Loading Than Rearfoot Strikers. Medicine & Science In Sports & Exercise , 2306 – 2313. Larson, P., Higgins, E., Kaminski, J., Decker, T., Preble, J., Lyons, D., Et Al. (2011). Foot Strike Patterns Of Recreational And Sub-Elite Runners In A Long-Distance Road Race. Journal Of Sport Sciences , 1665–1673. Michaud, T. (2011). Human Locomotion: The Conservative Management Of Gait Related Disorders. Washington: Newton Biomechanic. Milner, C. E., Ferber, R., Pollard, C. D., Hamill, J., & Davis, I. S. (2006). Biomechanical Factors Associated With Tibial Stress Fracture In Female Runners. Applied Sciences , 323 – 328. Murphy, K., Curry, E. J., & Matzkin, E. G. (2013). Barefoot Running: Does It Prevent Injuries? Journal Of Sports Medicine . Novacheck, T. (1997). The Biomechanics Of Running. Gait And Posture , 77 – 95. Ogueta-Alday, A., Rodri´Guez-Marroyo, J. A., & Pez, J. G.-L. (2014). Rearfoot Striking Runners Are More Economical Than Midfoot Strikers. Medicine And Science In Sport And Exercise , 580 – 586. Poulos, N. (2014). In Australian Strength And Conditioning Association. Helensvale: Asca.